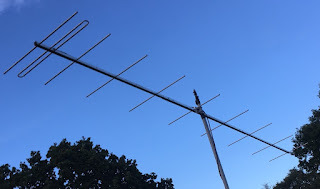 @ M0BEW 10 element 144MHz EME Yagi OWL-G/T. Performance, details, construction and comments. 12.7mm and 9.525mm diameter tube OWL loop. 12.7mm elements with a wall thickness of 1.2mm. A direct 50 Ohm feed-point. No matching. Boom to mast bracket to fit upto 50mm masts. Very tidy and well constructed.